Is it no option to exclude some tests in IntelliJ IDEA Ultimate? I want to run unit tests in IntelliJ but exclude the integration tests. I name the integration tests with *IT.java so the Maven failsafe plugin can run them seperatly from the unit tests. It matches against the class name, so you don't need to match .java extension. Regular expression will not match if the class name ends with IT using the negative lookahead. With JUnit5, you can now tag your tests, e.g: @Tag("integration-test"). 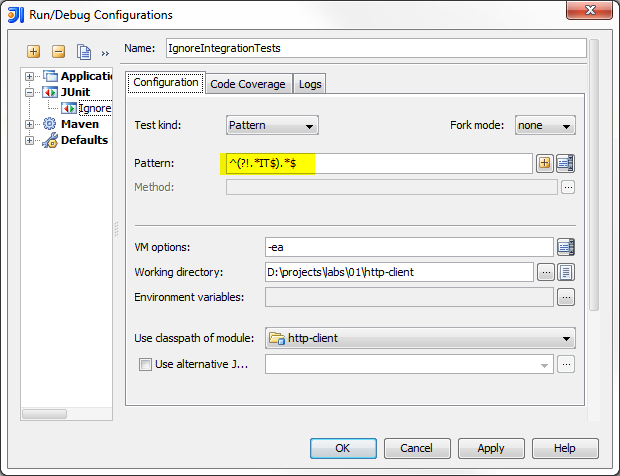 Also, given IntelliJ supports now JUnit5 as well, you can then create a JUnit Test Configuration and select Test Kind: Tags (JUnit5). To exclude let's say "integration-test", you just need to specify as tags: !integration-test, and IntelliJ will run all your JUnit5 tests except the ones tagged with integration-test. I would split them to that they are in different packages. They are doing different things after all. You can then run your tests per package. This link details how to do this. Not the answer you're looking for? Browse other questions tagged java maven junit intellij-idea or ask your own question. In IntelliJ IDEA, can I run only tests matching a regex pattern? Why doesn't this negative lookahead work the way I expect?